Tuesday afternoon I prepared foods to bring along for dinner. I was working over dinner time at Weight Watchers and wanted to go to a Pilates class right after that (I made it too, thankfully the cops weren't on 101 tuesday night!). I prepared whole wheat couscous (oh surprise!) mixed with precooked lentils and diced red bell peppers. I also cooked bell pepper strips with thinly sliced shallots, salt pepper, and a little lemon juice. I packed it up in my little red 2 tiers bento with a small container of guacamole. Wednesday I packed my husband bento with leftover couscous, leftover pepper strips, 2 Morning Star sausage patties and a packet of the Weight Watchers mini-cookies. It doesn't look like he has much, but his bento is pretty big (1500 ml) so I rarely fill it up. Today we had the same foods, but packed differently. I don't have a picture of his bento because he finished it up later after I had left for work. Upper part of the left tier: Whole Wheat couscous with lentils and diced red bell pepper (the rest of what I prepared tuesday afternoon). Lower part of the left tier: Teriyaki chicken pieces. Upper part of the right tier: Lettuce (everything else was strong tasting so I used that as a "neutral"). Lower part of the right tier: Steamed broccoli, snow peas and mini peppers with spices. My husband had the same lunch, got it all ready... and left it on the counter! Oh well, it was in his cooler bag with an ice pack so I'll have it for lunch tomorrow! He's having lunch out anyway. It was very good, very tasty and filling. I forgot to have breakfast today AND forgot to bring a snack. I was starving by lunch time. It was enough to tie me up until I went to get my hair cut (FINALLY!). I don't have pictures, we didn't have time to take any. 5 minutes before he was going to leave, my husband realized that he had forgotten lunch. Now what? I used the little black "snack bento" and threw in 2 frozen Oyaki, an 1 Onigiri, and put that in the cooler bag. I also put a frozen cup of chicken curry in the bag (it's in a Tupperware of course!). The bento I used is the long black one with the stipes. It looks bigger than the other two, but actually it's smaller since it's only 1 tier. I use that one and the red one as "snack bentos" thought I realize as I use them that they hold a lot more food than I thought! I'm not a happy camper, today I put the bentos together, and made them all pretty with flowers n everything and went to take pictures... dead batteries in the camera! OH NO! So I took pictures with my cellphone. Not very pretty, I need to work this out! Can't have ugly picture after working so hard!!! Anyway, I did prepare two bentos today, I was teaching and my husband wanted to bring lunch to work. Each of us had hardboiled eggs (one shaped like a fish, and one shaped like a little car), bulgur (leftover from last night) steamed broccoli, and a salad made of lettuce, cucumber and red bell pepper. 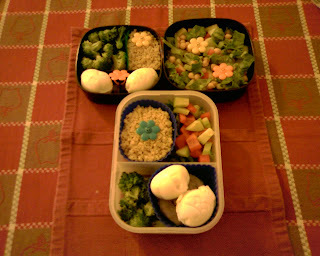 In my bento (the black one on top) I added chickpeas to the salad. My husband isn't crazy about chickpeas unless cooked with other stuff. I also gave myself more salad and more broccoli. I love vegetables, he likes them, but doesn't like to overdo them. 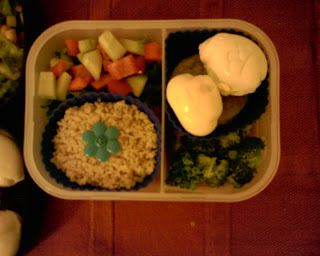 I used my little "grass dividers" to keep the bulgur from mixing up with the broccoli. It worked too. I didn't think it would stay put. It did! It was all cute too! Too bad I don't have a good picture of it. So my husband has the plain salad (lettuce is hidden under the cut up pepper and cucumber), and less steamed broccoli. To make up for it, I snuck an Oyaki under his hardboiled eggs! It was not very original, but I was in a hurry so I threw in whatever I could find. It was filling and good. My husband was happy with his lunch too. That's all that counts right? Last night my husband had something going on in San Rafael, so he went down there straight from work. I was on my own until late and decided to experiment. On justbento.com, I had seen a recipe for Oyaki and thought it might be very interesting to try, so I did! The only different thing I did was to use canola oil instead of sesame oil. For filling I used leftover ground beef (extra lean) that my husband had made the previous night for tacos. I put that inside the Oyakis, and sprinkled some cilantro over the meat. Other than that, I followed the recipe and the results were Great! Last night I steamed broccoli in my microwave mini-steamer. I also soaked bulgur in boiling chicken broth, adding salt pepper and ground coriander (and a little hot pepper powder I think). Finally, I made a fruit salad using a mango, fresh strawberries and a plum. I was on a roll really. So today I was teaching, so I had to prepare 2 bentos: one for me, and one for my husband. Actually I prepared 3 bentos because I knew that lunch happens late at the school I was at and that we had a "snack" with the students so I decided to prepare a "snack" bento also. In my small red bento (the one on top) you can see my fruit salad in the lower tier (top right container). Beside it you can see the upper tier with a little container filled with yogurt (mixed with a little honey, and there's also raisins (I had way too many raisins, but I shared so it was all good). In my "lunch bento" you can see, in the smaller lower tier on the left, the two Oyaki (I picked the smallest two) with the steamed broccoli and the bulgur in the divided section. On the right, in the larger upper tier, there's a salad (greens, red bell pepper, cucumber and cilantro) and a little sauce bottle filled with fat free balsamic dressing. I find that my "lunch bento" bento to fit be very well with my "way of eating" because the smaller lower tier is just big enough to put the grains, proteins and cooked vegetables. The bigger upper tier is perfect for raw veggies and salads which are filling and very low calories. Basically it's the same thing. His Oyakis are much bigger than mine, he also has more grains than I did, more fruits and more broccoli. You see, he's not overy crazy about salad. I still snuck some in there with a little bottle filled with italian dressing. I love to be able to carry the dressing in little bottles, the salad remains fresh and crispy! We were both very happy and satisfied with our lunch. The Oyakis turned out to be very good. I tried to eat one cold (since I try to have food that don't need to be heated in my bentos) but it wasn't very good. So they DO need to be heated. I think that I'm going to start making bentos for myself on non-work days. I just love it! I didn't have much leftovers to work with today. I had some couscous, and we still had a few mushroomless frittatas. So I used my little one tier Bento to put that together for my husband. This weekend we went to a party store, just for the fun of it, and I found those rings, that are just cheapos "smiley flowers rings". I washed it carefully and snuck a blue one in my husband's box. Cute isn't it? The couscouscous is cooked with cinnamon, garam masala and chili powder in organic vegetable broth. I chopped some red bell pepper, cucumber and added shredded carrots and raisins. As always I didn't add any fat to it and it tasted just fine. I knew that it wouldn't be enough for mister 6'2 tall husband, so I added a bowl of pea soup to which I added some corn and chopped canadian bacon. Hopefully it'll be enough to tie him up until tonight. Today I as subbing so I had to pack my lunch. I finally got to try out my egg molds! Look at that! A little car and a little fish, one of each per box! Each of us had almost the same foods: Curried couscous with chickpeas, shredded carrots and minced jalapeno pepper; Hard boiled eggs (in cutsy shapes), greens with shredded carrots, and veggies sticks (carrots and celery). My husband's box (his box is the lock and lock at the bottom of the picture) also had 2 mini-frittatas and a little less veggies than I did. He's a big guy, he needs more proteins than I do. He's also not a huge fan of raw veggies. I didn't write down the recipe for the couscous, I simply cooked it in chicken broth with about 1/2 to 3/4 teaspoon of madras curry powder. Then I added whatever I had on hand, which wasn't that much really. We both had many comments about our funky eggs! Again lunch was very filling, and the couscous, made on the fly at the last minute, tasted very good. Now I need a rice cooker! I'm not working this morning, so I don't need to pack lunch. I was going to just let my husband grab a frozen tupperware, but he looked a little disapointed, so I decided to put together a bento for him. My husband made Turkish Meatballs (top-left corner) and salad (bottom-right corner) for dinner last night, and I packed leftovers for his box. I used my little sea critter skewers to eat the meatballs with. I added Mediteranean Hummus (on top of the salad) and vegetable sticks (top-right corner) to it, and steamed snow peas (bottom-left corner) in my microwave steamer I got at Ichiban Kan. It was the first time I tried it and it turned out pretty good. In my shopping saturday I bought 3 bento boxes. 2 of them are smallish boxes, that I'm planning to use on "outings" with my husband. The bigger one, I want to use as my "every day bento". It's perfect for the type of meals I eat: a little proteins, grains, cooked vegetables in the smaller, divided lower tier; and a salad or cut up raw veggies and a dip in the bigger upper tier. Today, I didn't have cooked veggies so I ate more grains, actually a little too much grains. Next time, I'll cut down on the grains and add steamed vegetables, or a vegetables stir fry or something like that. Again, the grain was couscous, cooked very simply with salt pepper and a little lemon juice. As proteins I had 2 mini-frittatas, and cubed ham that I skewered with my little sea critter skewers. In the upper tier, I had cup up cucumber and red bell pepper and home made Mediteranean Hummus in one of my little containers. My husband had the same thing, he's still using the lock and lock box, and you'll notive that his vegetables are hidden under the little hummus container. Sneaky! I also gave me a little more ham, but made only 3 skewers that I put on top of the pile of ham cubes. I didn't have the time or the patience to skewer all of it. Here's a view of my box closed. I bought cheapos elastic bands to hold my boxes closed, and I think they fit just fine on my lovely black box! I was very satisfied with my lunch, there was a little bit too much couscous, but it was very light, and I had little proteins so it balanced well. My husband was very happy with his lunch, also he was bragging to coworkers about it. Both my coworkers and my husband's seem impressed with this. That's fine by me, but I'm doing this for the fun of it. It's a blast! We went shopping! And we had a lot of fun. First we went to Kamei, and didn't buy anything. We wanted to see what was up in Japantown first, and come back if we needed to. We didn't, but that doesn't mean that there wasn't anything to get! They had plenty of tupperware type bentos, and stuff, and lots of cooking things. They also had a few more laquered looking bentos, but they were too big for my taste. The other thing with Kamei is that I go there very often, so I can always stop by on another trip. After that we stopped by Green Apple, of course, and there my husband found me a cookbook (enabler!) it's called Secrets from a Healthy Asian Kitchen, by Ying Chang Compestine. After Green Apple, we took off for Japantown. First we stopped at Soko Hardware. They had a good selection of rice cooker there at very reasonable prices. I didn't buy one cause the one I needed was still out of my budget (I'm waiting for a paycheck!!) but I might just stop by again soon. I looked around real quick, but decided to go to Ichiban Kan first, and then come back to Soko. We went to the mall and found Moritaya first. We didn't find anything there. They had a few small and very overpriced boxes. Really I wouldn't waste any time there anymore. Finally we made it to Ichiban Kan. Oh my, it's like a candy store! We bought 2 small bentos, eggs molds, small containers (4 round and 4 rectangular), a mini microwave steamer, decorated plastic toothpicks (with seacritters at the end, too cute), elastic band to hold the bentos (2 packs of 2) and onigiri molds (triangles, and cute shapes). All of that, plus a little bag to hold my husband's contact lense stuff and his glasses for $18! After that we went back to Soko Hardware, and I bought another bento (2 tiers, bigger then the ones from Ichiban Kan) and I found mini sauce bottles! I couldn't find them, but I asked the lady and there they were! I want to mention that the staff at Soko Hardware is absolutely wonderful. They answered my million of questions about rice cooker (I want one to make brown rice) and found the tiny sauce bottle for me and everything! I'll stop there again for sure! This is everything that we bought! All of this for about 40$! I love San Francisco. Mini steamer, I wanted this to be able to steam veggies real quick in the morning.. also it's big enough for steamed buns and for potstickers! Mini containers, mini sauce bottles to carry to goodies along! Egg molds and Onigiri molds! I can't wait to try them out!!!!! And finally, my bento boxes, the two smaller ones were from Ichiban Kan, $1.50 each!!!! The other one, the bigger quare one, was from Soko and was about $10. There you have it! My Bento shopping expedition. I found pretty much everything I was looking for. A few things I figured weren't worth getting, others I'll get later online. We had a lot of fun really, and now I'm all the more optimistic about the whole thing! Ok, today I was teaching, and it was not a last minute thing, so I knew I needed a lunch. So yesterday, dinner was planned with the bento in mind. I explained in my previous post what I planned so here's the pictures! Top left corner of the "yellow box" (that's mine) is the mini-frittatas. In the "blue box" (my husband's) the frittatas on at the top right corner. In my box the chicken is on the top right corner, his is on the top left corner. Both are leftover from wednesday's roasted chicken. As dessert, we both have bluberries and I used cherry tomatoes to fill the gaps cause things were moving around a bit. At the bottom left corner (both boxes) is the Shredded Green Beans, with lemon-lime zest and snipped chives. I sprinkled shredded carrot over it just to make it look cute. I was in a hurry so I wasn't as careful with the sprinkling for my husband's box. On the bottom right corner, I have the Citrus-Chive Whole Grain Couscous. I sprinkled a bit of chives on there, but it was really small and it doesn't show on the picture. It was very filling and still "light". I got comments on my lunch from some of the teachers too. This is my most "bento feeling" bento so far! I'm all happy with it! Tomorrow: San Francisco, FINALLY!!!!!! I'll be reporting on my bento shopping adventure! I got my cookbook Bento Boxes, Japanese meals on the go. It's really great, simple, beautiful and very inspiring. I'm happy! The recipes in there are very interesting, and I think I'll be able to adapt it to my chosen lifestyle. I stopped by the Outlets in Petaluma and got me some big silicone cups (normal muffin size) to put in my bento tomorrow. I knew I had planned two different side dishes (Shredded Green Beans and Citrus-Chive Couscous) and I wanted to keep them separated. I also took out mini frittatas to eat with that, and I have leftover chicken. I even bought blueberries for dessert and extra veggies to fill the gaps! I'll post about it tomorrow with pictures and everything. This Bento thing really has renewed my enthusiasm to plan ahead and prepare things and have fun with food. Yesterday and today, I stayed home, so I didn't need to pack lunch. I'm still thinking Bento though. Yesterday my husband ordered "Bento Boxes: Japanese Meals on the Go" I'll get it tomorrow, I can't wait to play with it! 1- using a metal mini-muffin pan straight in the oven, with cooking spray. 2- Using a flexible silicone mini-muffin pan sitting in water, also with cooking spray. #2 proved to be MUCH MORE effective. They came right out... My metal pan is still soaking. I cooled the mini frittatas, and then put them in the fridge to make sure they were totally cold. Then I wrapped them individually in saran wrap and put them in a zip bag. That way they don't stick together, I can take them out one at a time. Sooo I've got plenty of mini-frittatas ready to jump into a Bento box when needed! It's ridiculous how much fun I'm having with this! Ok, today isn't overly original either, but I had to use up leftovers and to think fast. I had to be at work in another town at 7:45! Again I had a bulgur and lentil mix (bottom right corner) and a salad (bottom left corner). Today, for proteins, I had turkey pieces (top-right corner) that I marinated in soy sauce and dijon mustard overnight. I pan-cooked the pieces this morning and cooled them before boxing them up. I added a dessert to it. In the mini-tupperware, I have sugar free strawberry jello! The funny thing is that I bragged about my bento obsession to the assistant teacher I was working with and showed her the "Lunch in a box" blog that got me into this in the first place. After class I went to buy my second box and dividers, and who's there buying her first one? My assistant of the day! Now I have dividers, so I'll be done with my ugly foil-saran wrap dividers! I need little containers to put stuff though.. those glad things are just too ugly! As soon as I can make it to the city, I'm on it! So, as I said on my main blog I went ahead and got me a basic bento box. That was saturday. I couldn't wait to see how I could organize it to put a full lunch in that little box. I didn't have dividers, so I made one with aluminum foil and covered it with plastic wrap. It worked just fine! Left top corner: Bulgur, soaked with salt pepper and garam masala, mixed with chickpeas and steamed lentils (Trader Joes). Right top corner: shredded lettuce with salt, pepper, and indian chili powder. Left bottom corner: Steamed shrimps with salt, pepper, indian chili powder. I used paper cups to try to keep the shrimp stink from going everywhere. Right bottom corner: Cut up red bell pepper and celery. I had planned on making a dressing for the salad and cut veggies, but ran out of time. I ate it mixed with the bulgur mix. I didn't eat it all, it was too much food! So my first bento lunch isn't overly original, but it was good, and it was filling, and I had a lot of fun putting it together! I also had to bring breakfast, so I made Steel cut oats with a banana and milk and syrup, nuked it, and put it in my thermos. It was ok when I got there. My thermos isn't exactly the best. This is where I want to come and post my packed lunch, bento boxes, and picnic baskets. I think eating on the go is a challenge for a lot of us, and that there are so many ways for us to be able to make it not only work, but be fun and inspiring.